Almeria holidays take you to the driest part of Spain, the south east coast. 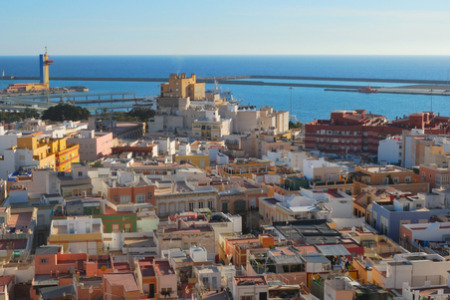 Although the summer is the most popular time to visit, holidays to Almeria can be taken at any time of year as the summers are long and hot and the winters are mild. Located in the Province of Andalusia, holidays in Almeria have broad appeal with families, couples and young adults flocking to its shores. A choice of good sandy beaches, warm clear waters and a variety of water sports are Almeria's main attractions. Add to these the charming old town, with its fortified cathedral and its stunning eighteenth century architecture, and you have a cocktail for success. We have a surprising number of cheap Almeria holidays waiting to whisk you away to sunnier climes. These are considered great value as our commitment to quality and service is never compromised. The town has numerous restaurants serving everything from traditional fish dishes, to fast foods and international cuisine. Shopping here is excellent with boutiques and specialist stores as well as market stalls. Although there are several lively bars, Almeria is not noted for its wild nightlife. If you are seeking respite from our unreliable weather, our Almeria holiday offers may be just the ticket. For more details and to view our best Almeria holiday deals, please use the search facility.